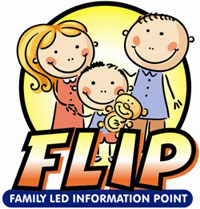 FLIP (Family Led Information Point) is for parents and carers of children with additional support needs in East Lothian. It offers parents and carers the chance to meet up and share experiences and access information about services and support for children with additional support needs and their families. FLIP parents and carers also get a chance to share their views on how services for children with additional support needs could improve.